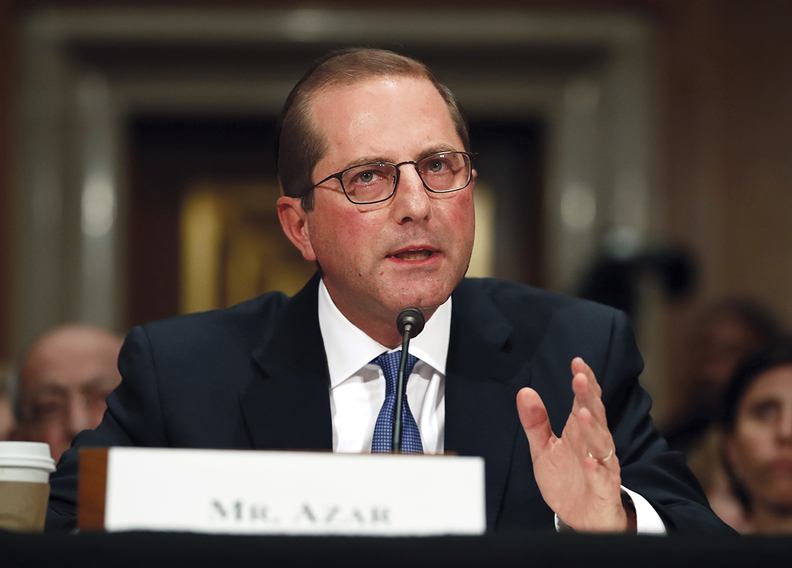 HHS secretary nominee Alex Azar told senators Wednesday that he would lower drug prices through boosting competition. While Azar avoided weighing in on other ideas floated by GOP and Democratic senators to promote drug price negotiation for Medicare or drug importation, he repeatedly insisted he would stop drug companies from gaming the system through patent extensions that let them block generics from entering the market. The Senate health committee held the first courtesy hearing to kick off Azar's confirmation process Wednesday, but the Senate Finance Committee will have to vote to advance his confirmation to the floor. The Finance Committee hasn't yet scheduled its hearing. Senators from both sides of the aisle drilled down on how he would deal with skyrocketing drug costs. Azar's nomination raised skeptics' concerns that he would be pharma-friendly since he has just stepped down as president of the U.S. branch of Eli Lilly & Co. During his tenure, Lilly's prices for insulin drugs Humalog and Humulin have spiked about 225% since 2011. Azar's tenure ran from 2012 to 2017. Some Democrats said his confirmation would put the "fox in the henhouse" since he, as a former drug company executive, would shape the federal government's policy on pharmaceutical costs. Conservative Republican Sen. Rand Paul of Kentucky said Azar would have to convince him he wouldn't be "beholden" to drug companies in order to secure his vote. Azar promised he would work with both sides on policy to lower prices, including increasing transparency on how drug companies set their price list. He repeatedly touted action he took as HHS deputy secretary under President George W. Bush to close a patent exclusivity loophole that he said saved consumers $34 billion over 10 years. Provider groups have largely applauded Azar's nomination to the post, and spokesperson for the American Hospital Association said greater generic competition is crucial and would help hospitals and patients. Azar wants to focus on changing electronic health records requirements for providers. He called the current system burdensome and useless without "interoperability." Committee members from both sides were receptive, and health committee Chair Lamar Alexander (R-Tenn.) said he plans to convene bipartisan roundtables with Azar to work out a better approach to the requirement. Azar also promised Democrats he would continue working on developing alternative payment models and applauded the progress former HHS Secretary Sylvia Mathews Burwell made in developing new care and payment delivery models under the Obama administration. He said he especially wants to focus his work on Medicare because of the high concentration of people in the system. Azar waded into controversial ground when Democrats pressed him on his views of Medicaid. He supported the concept of Medicaid block grants, with the caveat that the policy details would have to be carefully worked through. The GOP proposal to convert Medicaid into a per-capita cap system helped tank the Senate Republican health care bill that lawmakers structured around the Medicaid cuts the new system would propose.